Over the summer, we were the happy recipients of a cast-off fridge from Mindy’s aunt and uncle. 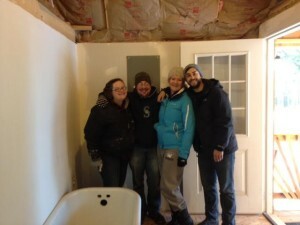 They had bought a new one and were just looking to offload the old one, and we were building a kitchen from the ground up and had no appliances, so it seemed like a great fit at the time. 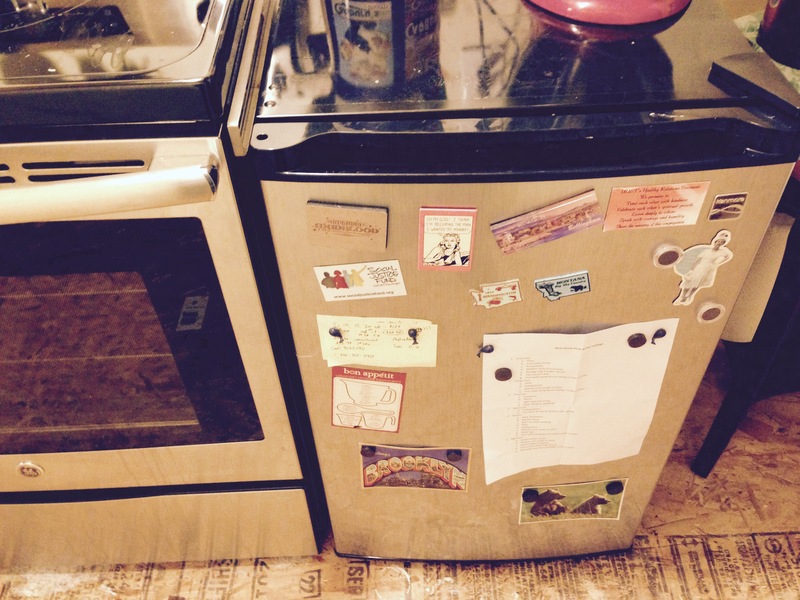 Unfortunately, the kitchen was nowhere near ready, and the fridge sat on our front porch for several months. It savored the seasons as summer faded into fall. I brushed leaves off it before winter’s fog and storms and snow came. Finally, we moved in and brought the fridge with us, but I think its heart was set on being outside, because it decided to stop working. Now it’s back on the porch where it started, until I can find another use for it or get it hauled away. I don’t know if you’ve gone fridge shopping lately, but new refrigerators are expensive. Like, stupid expensive. Like, if I’m going to spend that much money on an appliance, it better make my food for me and compliment my good looks. Also, they take up a lot of room. We have a little kitchen in a little house and the more we shopped, the more we realized we were reluctant to commit that much space to a giant freaking hulking appliance. So we decided to do something different, because that’s kind of what we do. We got a mini-fridge instead. And so far, we’ve loved it. Man, is it hard to get a good picture of a fridge! It’s tiny! It’s 4.4 cubic feet and only 20 inches wide. We still have space to put a 30 inch kitchen cabinet next to it, and now we can put a 50 inch butcher block on top of both of those — that gives us so much more counter than we ever thought we’d have! It’s efficient. When we broke down what we kept in the fridge, the bulk of what we needed fits in 4.4 cubic feet. We keep eggs, milk, fresh veggies that we plan on using in the next few days, cheese, miso, a few small bottles of condiments, and not much else on hand. With a larger fridge, we kept all that stuff, plus about two shelves of leftovers in various states of decay. It’s impossible to hoard leftovers when space is at a premium. It’s taught us a lot more about what needs refrigerated and what doesn’t. We were already pretty good about that, but sometimes it’s good to have a reminder. It’s energy efficient, too. Our new fridge does the same job as our old fridge, but costs half as much to run each year. I do worry that as spring and summer roll around and we have abundant fresh fruits and veggies on hand again, we’ll have no place to put them. But then I remembered that refrigerators for home use were only invented in 1913, and people got by without them just fine for generations before that. One thing I plan on doing when spring comes around is construct a root cellar (I haven’t decided what type yet.) This is one simple way to store more stuff if you have a small fridge. Another is just to change habits. My Mum is British and has always commented on the stark differences between the European kitchen and the American kitchen. The size of the fridge that we have now is closer to what she grew up with in the U.K., and that served her, her two siblings, her two parents, and usually a few members of her extended family just fine. The difference? They’d stop by a green grocer daily if necessary, or make do with what had been stored in root cellars. I pass at least three major grocery stores on my daily travels, and I can stop at any of them and get whatever we need on an ad hoc basis. I can’t quantify my suspicions because I don’t have the data, but I suspect that we’re actually saving money despite going to the store more often; the average purchase is $5 or less a day on veggies, and we use all of it. In the past when we did more traditional grocery runs of once a week or less, we would always have plenty that got thrown away. Americans have a unique relationship with refrigerators, and maybe it’s because my roots don’t run deep in this country that that relationship has never sat right with me. So far, this switch has worked out well for us! 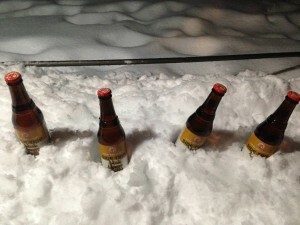 Though I don’t know how I’m going to keep my beer cold once the snow melts. AKA the Stevens County Beer Fridge. It’s funny how the holidays, which I believe were intended to be a time set aside for slowing down and reflection, can actually be a crazy busy time. I know our holidays were like that. They were also wonderful, though. We were very lucky to have family come out and visit us for Christmas. My parents were here for almost a week, and it was so nice to have them here. Mindy’s sister Katie and her boyfriend Mark were also here for Christmas — I wish we could have spent more time with them. Considering that it snowed so heavily that they closed Snoqualmie Pass on Christmas Eve, it’s a miracle that everyone made it over (for those of you not familiar with Washington state geography, Snoqualmie Pass is the main east-west corridor through the Cascades, and one of the only ways for people in Seattle to get east of the mountains.) Christmas was a very packed house (at Mindy’s mom’s, thankfully — we never would have fit everyone in the Cabbage at once.) It was so great seeing everyone, though! The past two weeks have gone by in a merry blur. 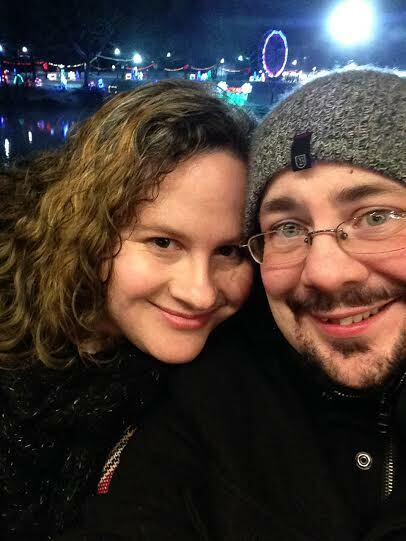 I spent New Year’s Eve working, but luckily Mindy was able to come into town with me, and after I got out of work, we took in some of First Night Spokane. I highly recommend it! Anything with bonfires in the middle of the street is worth checking out. But now the New Year has come and gone, and inexplicably, it is 2016. This means launching into the year with gusto. I’m working a lot more this year, which probably means fewer posts from me. My plan for this year is to produce less content, but have that content be a little bit more meaty. In the meantime, there is so much to do. We have the shower ordered, and I can’t tell you how excited we are to be able to bathe in our own house (provided that our septic system is okay.) We need to do something about the kitchen counter, and there’s a lot of KonMari-ing to do. As Mindy noted in her last post, since moving in, we are acutely aware of everything we still need to do. But we can do it! I’m excited about it. 2016 is shaping up to be one of the best years we’ve had yet. I can’t wait to share it with you all. 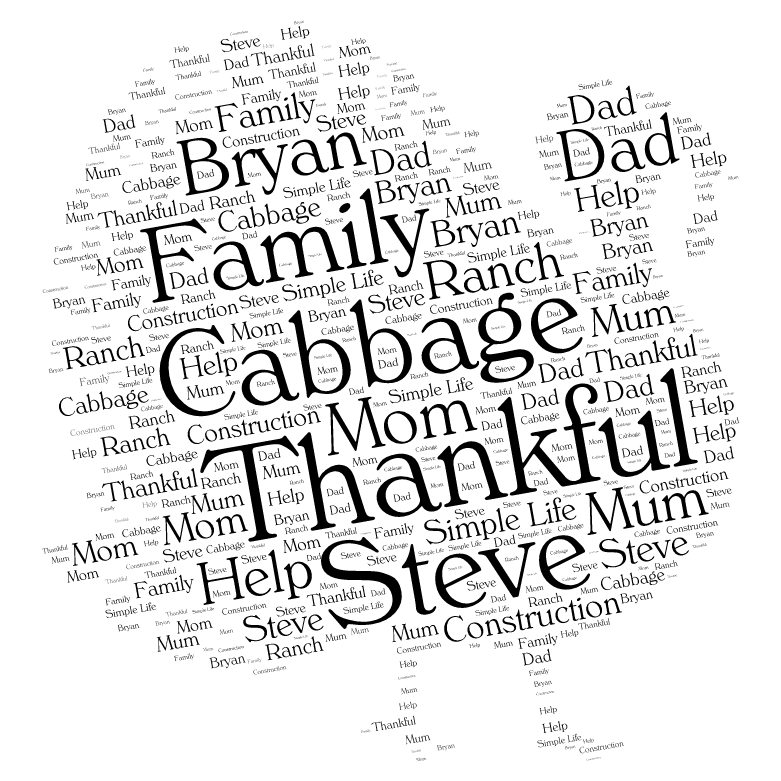 Now that we’re living in the cabbage, we can never forget how much work still needs done on it. None of the ceilings are finished yet, so the entire space pretty much looks like this. Between the lower branches of the Christmas tree, you can just make out the OSB that’s serving as a sub-floor until we can afford to get flooring in. We don’t have anything resembling a kitchen counter yet. We’re borrowing the sink from Mom, and housing it in a frame that Steve built out of 2x4s. That yellow chimney cabinet in the picture is our pantry and our kitchen cabinet in one. We have running water in the sinks, but the clawfoot tub isn’t hooked up yet, so we have to go shower at my parents’ place (which is also where we’re doing our laundry). And that’s not even mentioning all of the finish work that still needs done — the windowsills, the trim, the rest of the tiling in the bathroom. To be honest, it’s a little exhausting to think of all the work we still have ahead of us. Sometimes this feels like the project that will never end. Realistically, it probably is. We’re already talking about building an extension on this summer to expand the kitchen and dining are. But over Christmas, we took a break from construction and just focused on enjoying this place, exposed insulation, OSB floors, and all. 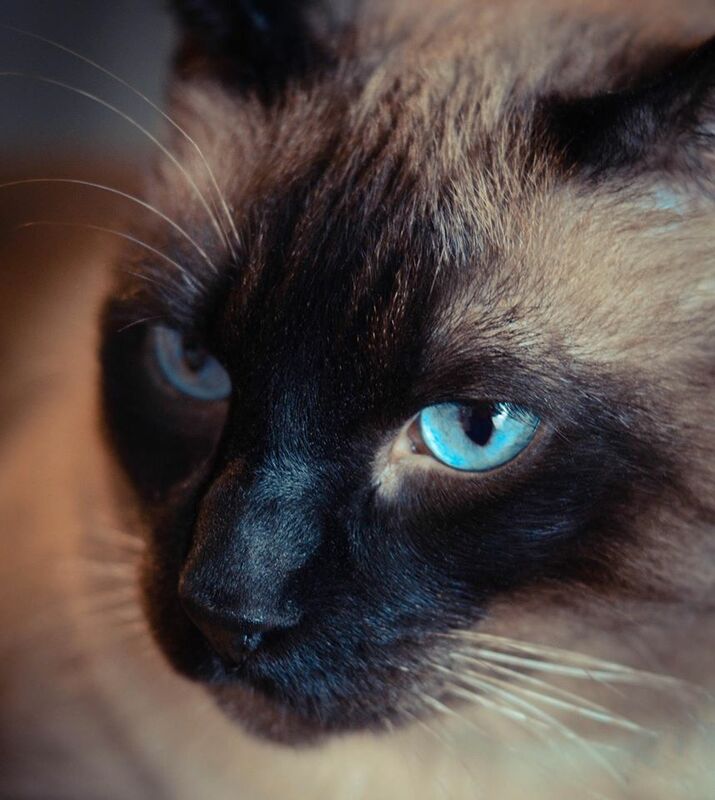 Nobody has enjoyed it more than our cat, Nicky. He was in the cabbage for about 15 minutes before he figured out how to get into the bigger loft. We stuck his floor pillow up there, so he can curl up by the heater and look down on us. It’s a nice change from being locked up all the time, and he seems a lot calmer and happier now. He’s not the only one. It’s nice to be in our own space again, unfinished or not. Now we’re starting to settle into the rhythm of living here, and brainstorming how to make it work better for us. We’ve had some requests for photos, so we’ll post a bunch soon. It will be a good motivator to clean up some of the clutter that naturally accumulates when you have too much stuff and nowhere to put it. I’m sensing several rounds of Kon-Mari-ing in the future! 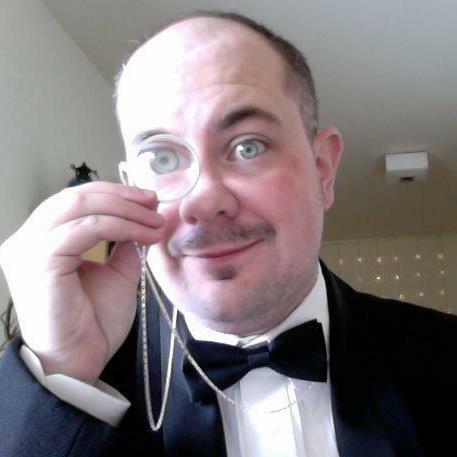 We’re also looking over our furniture with a critical eye. We’re definitely going to have to replace the couch for something smaller. I’m advocating for built-in benches under the windows, but Drew is unmoved by my arguments. We’ve also talked about replacing the dresser. And that’s not even mentioning all of the other work that needs to happen here! We hope you all had a great holiday season! We hope you’ll stick around to see what we’re doing in the new year! Nicholas. Photo courtesy Jessa Lewis. While cleaning the room in preparation for our move, I found a bundle of letters hidden behind the couch. After some lengthy examination, I determined that they had been written by the cat. They might be some type of a diary. Nicholas has been living with us in the spare room since we arrived here in July, and unfortunately, due to my mother-in-law’s cat allergy, that’s the only place he’s been. I can’t imagine having your world condensed to one singular bedroom, especially after being king of the apartment for so long. But I’m not the best person to tell this story. Let’s hear from Nicky. “Despite nightly protests, the food-bearing human has not yet granted me parole, or even access to a counsel. Mousey says the protests might not be enough. Mousey speaks of more drastic action. I have tolerated the humans thus far, but this injustice has gone on long enough. Perhaps Mousey is right. Perhaps it is time for revolution. The letters end there. Sounds like it’s been a rough go for poor Mr. Nicholas. Christmas is a close second, though. I absolutely love the Christmas season. Mindy and I have all sorts of traditions that we’ve developed over the years, and I’ve been looking forward to observing them for the first time at the Cabbage. There’s the baking (and we just got our stove on Monday! ), the storytelling (internet gets installed up there soon! ), eggnog and autumn bottom, Yuletide and guitar playing on Christmas Eve. Together we’ve built some beautiful memories and I’m really looking forward to adding more. 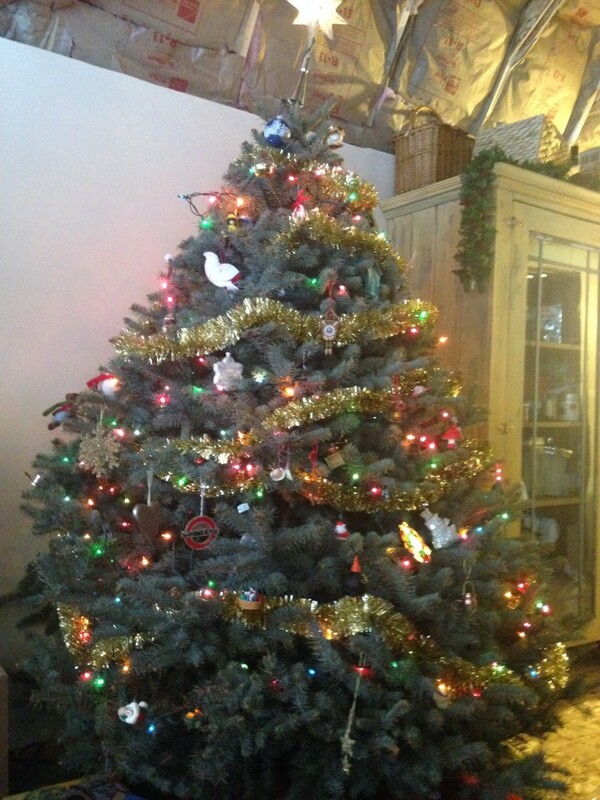 But one problem — all our Christmas stuff was still in my parent’s basement on the other side of the state. We were lucky, though, because Mindy’s sister Katie and her boyfriend Mark were able to save Christmas for us. Mark went up to my parent’s house in Snohomish County, grabbed our Christmas box (the box with all our ornaments, the nativity, and our tree stand,) and brought it over to us for Thanksgiving. Thanks, guys! I haven’t opened it up yet because we’ve both been sick and busy. The time between Thanksgiving and Christmas is notoriously busy for teachers — they earn their break at the end of the year. I’m wrapping up the class I’ve been teaching at Spokane Tribal College for the past three months. And I recently took a position at a local economic development/human services agency. As busy as things are, though, we’re looking forward to taking the time to string Christmas lights up at the Cabbage and (finally) move the rest of our stuff up there. We’ve been getting light snow and I can’t wait to see the Cabbage lit up like a gingerbread house. Pictures soon. It’s Thanksgiving, and we are taking a break from the worry and hurry of everyday life to come together with family and enjoy Thanksgiving dinner. 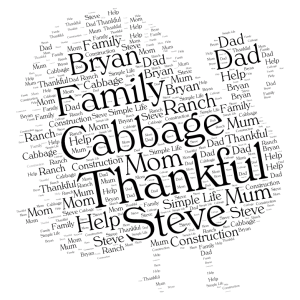 We have so much to be thankful for this year, as we have written before. When the events that set us moving out here in motion started back in May, things could have turned out so differently. But it feels like we are in the right place, doing the right thing, and we have learned so much throughout this process. So, our heartfelt thanks to everyone that has helped us on our journey. Here’s to the dreamers, the doers, and folks that want a different way of life. With the cabbage nearing completion, Drew and I decided to start making ourselves at home by eating some of our meals up there. As much as we enjoy sharing meals with Mom and Steve, sometimes it’s nice to sit down and eat as a couple. Over the course of the last few months, we’ve eaten out a few more times than we should for that reason. Shifting those meals up to the cabbage is a lot easier on our budget, not to mention my waistline. We don’t have a functional kitchen at the cabbage yet( although the plumbing is pretty much done, thanks to Steve, and our range has been ordered), but we weren’t about to let a little thing like that stop us. After all, we DO have electricity! 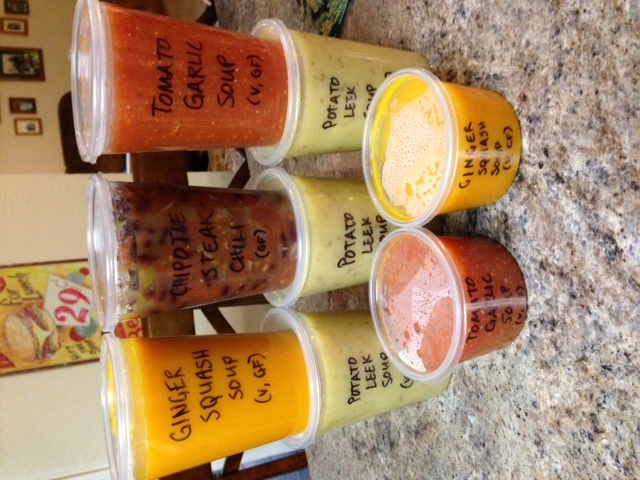 One day while my parents were at work, Drew commandeered their empty kitchen to make soup. 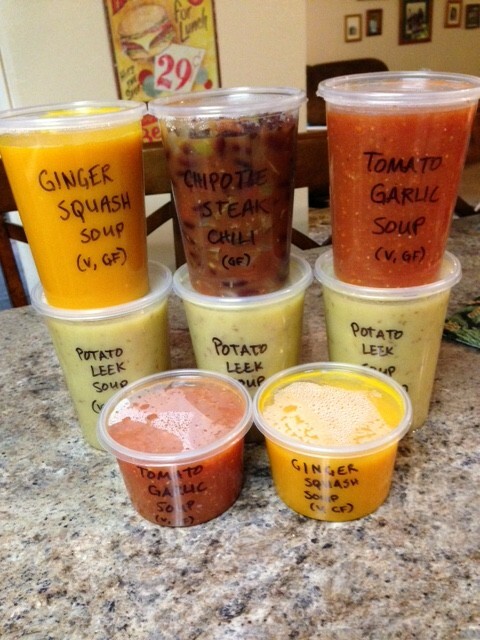 I’m not kidding — he made ALL of the soup. He froze it after portioning it out into smaller containers (each of the big ones holds just about the right amount for two people). Now, when we want soup, all we have to do is heat it up in the slow cooker. We tested it out for the first time last week. 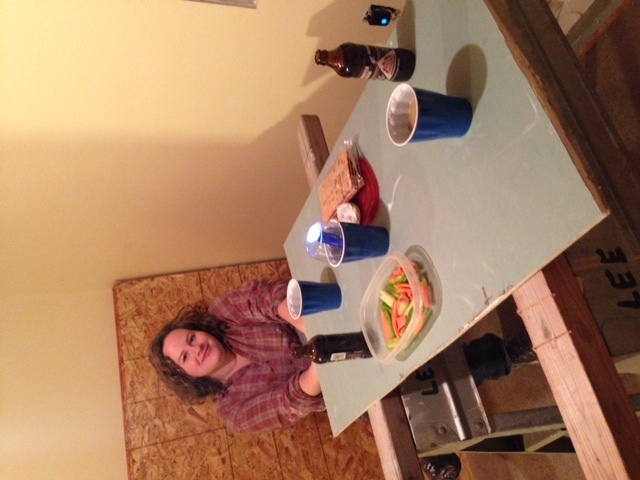 We dined in our future bedroom, since it was the closest to being finished, with a sub-floor and painted walls. A couple of sawhorses and a leftover chunk of drywall served well as a stand-in for our dining room table, which is currently residing in my in-laws’ basement. It didn’t make sense to open our box of dishes without someplace to safely unpack it, so we sipped Drew’s butternut squash and ginger soup out of plastic cups. Some crudités, a box of Ak-Mak crackers, and a little wheel of goat cheese rounded out the meal. 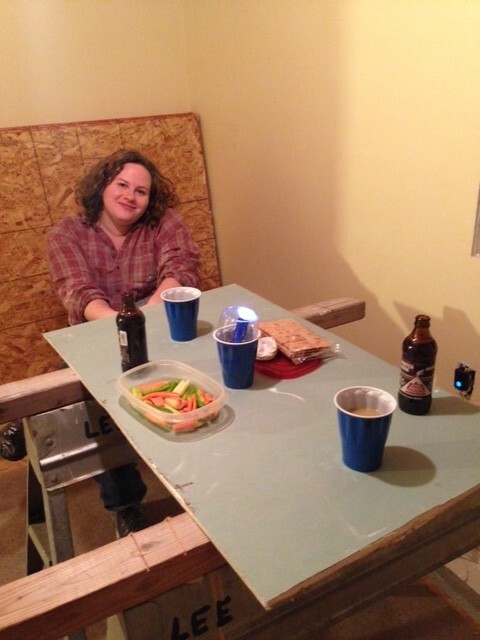 The resulting spread wouldn’t have won us any decorating awards, but it felt monumental just to eat in our own space. Look at the spread, not at me! Was it crazy to go to that much trouble? Yeah, probably. Do we regret it? Not at all. Cooking and eating together has always been one of the cornerstones of our relationship, and we’ve missed it. We’re looking forward to many more delicious meals to come. So, something strange happened at the cabbage. We were cleaning up the other day, and I found a lift ticket to our local skiing area. This in itself is strange, because none of us ski. But the strangest thing is that this lift ticket was dated February 11, 1996. How did the ticket appear in the midst of our newly-constructed cabbage? The cabbage was built in July 2015 and nearly everything in it was purchased shortly thereafter. In 1996, I was a junior in high school, in Lake Stevens. Mindy was a freshman. She lived here, but she didn’t ski. Neither did her sisters, parents, or anyone else she knows. Maybe it fell out of one of Steve’s toolboxes? Unlikely, because Steve doesn’t ski either. Research shows that February 11, 1996 was a Sunday. The Spokane River had been at flood stage for several days but was receding. The East-West NBA All-Star Game was played in San Antonio, with the East beating the West, 129-118. The number one song in America was “One Sweet Day” by Mariah Carey. So how could a lift ticket, which was likely not in the possession of anyone who would be at the cabbage, mysteriously disappear for 18 years, only to reappear in a construction zone? The best answer, I think, is a rift in space and time. Obviously, when we began construction on the cabbage, we somehow tore through the fabric of space-time, and now we are selectively receiving rubbish from a parallel 1996, one in which Mindy skis. Or someone else in the house. Probably not me. I’d break my neck. And in that parallel 1996, they are probably receiving bits and pieces of present day 2015, because I can’t find the switchplates that I’ve purchased. But unfortunately, those aren’t as exciting to find in 1996 as a unfathomable lift ticket in 2015 is. That’s my best guess, at least. How do you think the lift ticket got there? Prior to starting on the cabbage, my most ambitious DIY projects have all been in the realm of sewing. I’m not a great sewer, but I do enjoy it, for much the same reasons I’ve enjoyed construction. There’s something incredibly satisfying about transforming raw materials into something new and useful. It makes sense, then, that a maxim I first heard in a costuming forum several years ago holds just as true in the building world. It’s only possible for a given project to have two of the falling three qualities: fast, good, or cheap. Wikipedia calls this the project management triangle, which I just learned when Googling it a second ago. I call it . . . 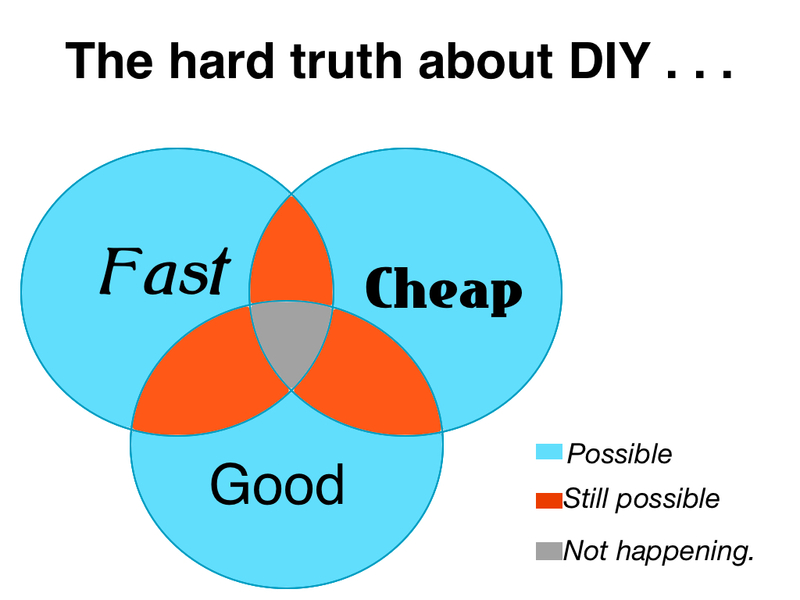 The hard truth about DIY is that you have to make compromises based on your priorities. The pre-constructed shed we bought to convert into our cabbage was fast and good, but a whole lot more expensive than building from the ground up. We prioritized speed in that instance. In other areas, we’ve emphasized the cheap section of the Venn diagram. The linoleum we’re putting into the bathroom is cheap and fast, for instance. We figure we can always tear it out and replace it when we have more money. For now, we’re sacrificing good for speed and frugality. On the other hand, the clawfoot tub we’re putting on top of that linoleum weighs in on the cheap and good section of the diagram. The sturdy, cast-iron tub is just the right size for an adult to soak in, and we got it for a good deal on Craigslist. And as we’re in the final countdown to our move-in date, it’s easy to get impatient. We want to be moved in yesterday — and I’m sure my parents feel the same way! I keep reminding myself, though, that the sacrifices we’ve made in speed have been either to save money (having Steve and Bryan help us out in their spare time, instead of hiring contractors) or to get a quality product (Drew’s patience mudding and sanding the drywall, maybe, or my own humble tiling efforts). There has been a lot of compromise in this project, but that’s just the nature of DIY. I recognized the sound the second I heard it. It was the same sound I’d woken to every morning when I lived in the dorms at Western Washington University. I’d lived in Fairhaven dorms, stack 6, and there was a huge Douglas fir outside my 2nd story window. I had my bed lofted — which is stupid, it just creates more room under the bed to make a bigger mess — and slept with my head to the window. 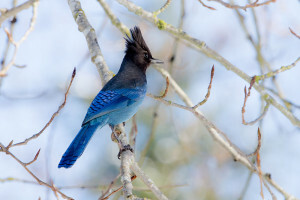 And every morning, there would be a shriek like a banshee inches from my ears, as the neighborhood Stellar’s Jay roused the campus from its slumber. And now, hundreds of miles and many years away from that memory, I found myself face to face with another jay. Photo by Eric Ellingson. 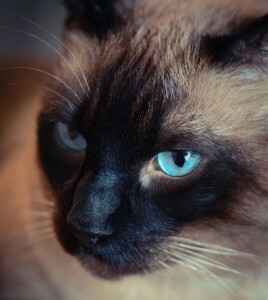 Shared under Creative Commons 2.0 license. Despite my immediate connotation of Stellar’s Jays (Cyanocitta stellari) as an unwanted alarm clock, I actually really like these birds. Like all members of the Corvidae family, they’re clever and gregarious. They’re pretty, too. It’s the only crested jay west of the rocky mountains, and I always liked to think of it as a little punk bird. Its shrieks kind of sound like an “OI-OI-OI-OI-OI” to me, although vocalizations can be widely diverse, ranging from pop punk “skreeka!” to the more familiar “ACK-ACK!” death growl. Jays prefer coniferous forest with a mix of open space. The ranch fits that description perfectly.This is their natural habitat. I guess they must compete with the ravens and crows around here. Or maybe they have a little Corvidae bird club in a hollow tree somewhere. Ravens would be the wizened old bikers at the bar, knocking back double whiskeys. Crows hang out at the pool table and drink pitchers of whatever the domestic beer is. And Stellar’s Jays are those guys that come in, order a Bud and a shot of Fireball, change the channel on every TV, and leave before getting into a full-on brawl. I don’t know why I was surprised to find a jay here, but I was. I’m really glad to see the jays here. They’re fun and entertaining. I just hope that they don’t resume their habit of waking me at an ungodly hour.